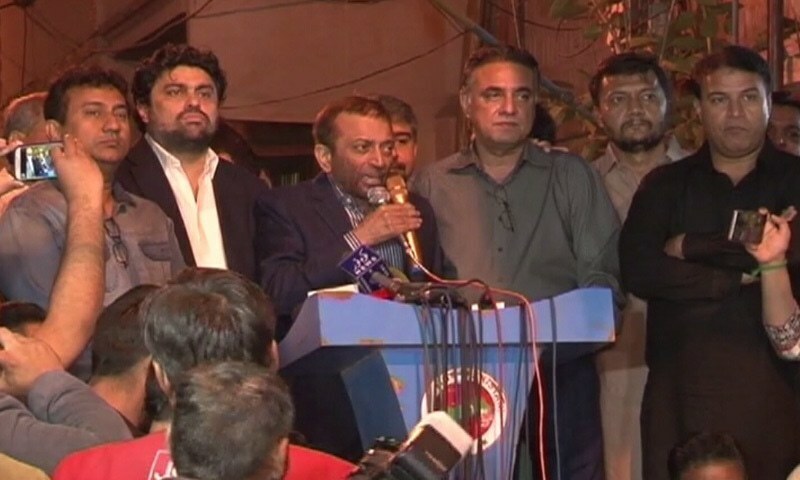 Muttahida Qaumi Movement-Pakistan’s (MQM-P) convener Dr. Farooq Sattar on Saturday offered his party’s coordination committee to draft a new mutually agreed upon list of four candidates for the upcoming Senate elections, vowing to visit the Bahadurabad stronghold of his intra-party rivals if his offer is accepted. Speaking to newsmen outside his residence in PIB Colony, Sattar backed down from his earlier demand of securing a Senate election ticket for his jeweller-turned-politician ally Kamran Tessori, saying: “This problem was never about Kamran Tessori, it was something else. “The committee had objected to Tessori’s candidacy on February 7 and I had agreed to it right there and then but then I couldn’t go to see them and problems escalated. Now I offer to the coordination committee that let’s draft a new list of four mutually agreed upon candidates from the total of 15 candidates. We will drop the names of whoever is controversial. Sattar remained “hopeful of finding a solution” but said that even if his latest attempt at resolving the impasse fails then perhaps the party should skip the Senate elections. “If we can’t even do that then I would advise that ‘let’s forget Senate seats and save the party,'” he said. Hours earlier, the coordination committee had announced that it was retracting the letter it had written to the Election Commission of Pakistan (ECP) in connection with nominations for the upcoming Senate elections. The coordination committee on Friday had asked the ECP to not entertain the nominations submitted by the party’s estranged leader, Sattar, claiming that it’s the committee’s privilege to do so. The committee had also announced that it was delegating the right to choose party’s elections candidates to deputy-convener Khalid Maqbool Siddiqui — a move which failed when the ECP ruled in Sattar’s favour, saying that nominating candidates for Senate elections is the sole right of a party’s leader, and since the MQM-P is registered in Sattar’s name, handing out party tickets will be his call. The letter to the ECP escalated the conflict, forcing the coordination committee to retract the letter on Saturday. MQM-P leader and MNA Kunwar Naveed Jamil told newsmen that Sattar objected to the coordination committee’s letter and sent a message that he would visit the party’s Bahadurabad centre if that letter is retracted. Jamil announced the retraction of the letter and said that a delegation of the coordination committee will pay Sattar a visit at his stronghold in PIB Colony. On Monday, a meeting of the coordination committee had been convened at the MQM-P’s temporary headquarters in Bahadurabad, where Dr Sattar had an altercation with senior leader Amir Khan when the latter, along with others, refused to endorse the former’s proposal to field Tessori as a candidate on one of the Senate general seats. Sources said that majority of participants seconded Khan’s views, upon which Dr Sattar boycotted the meeting and left for his PIB Colony residence in a huff. He subsequently summoned all party members, excluding the coordination committee members, to his PIB Colony home. Most MQM-P leaders had stayed put at the Bahadurabad headquarters, however, where senior leader Dr Khalid Maqbool Sidd­iqui spoke to the media to say that the party had decided to nominate Nasreen Jalil (on first priority), followed by Dr Farogh Nasim, Aminul Haq, Shabbir Qaimkhani, Amir Khan and Tessori for six Senate seats. He said Dr Sattar had wanted to “sacrifice” two of the top four candidates to accommodate Tessori. After Dr Siddiqui’s media talk, Dr Sattar emerged from his home and told reporters that it was ‘unconstitutional’ to hold a party meeting without his permission. Dr Sattar has often been criticised for favouring Tessori over seasoned party leaders and workers since he made the former deputy convener, gave him a ticket to contest a by-election on a Sindh Assembly seat (PS-114) and now wants to nominate the jeweller-turned-politician for a Senate seat. Worthy asylum seekers, or not?